McDonald's Japan has decided to bring the rest of the world to Japan via fast food. Well, not the whole world. For the burger joint's latest campaign, it's only been France, India, and Australia. As Snacktaku's embedded emissary in Asia, I take snack sampling very seriously. Snackology is an extremely important field, and one must continuously consume greasy or sweet (or both) treats in the name of study and research. That said, I missed the French sandwich and ate only half of the Indian one (my kid ate the other half; it was okay!). But I got the whole Australian sandwich to myself. Thing is, it didn't look very "Australian". And I say this as someone who has seen an Australian. To be fair, the other sandwiches were about as culturally accurate as "It's a Small World" at Disneyland. Before we dig into what would make this sandwich (or burger) more Australian, let's get a lay of the land—er, plastic tray. 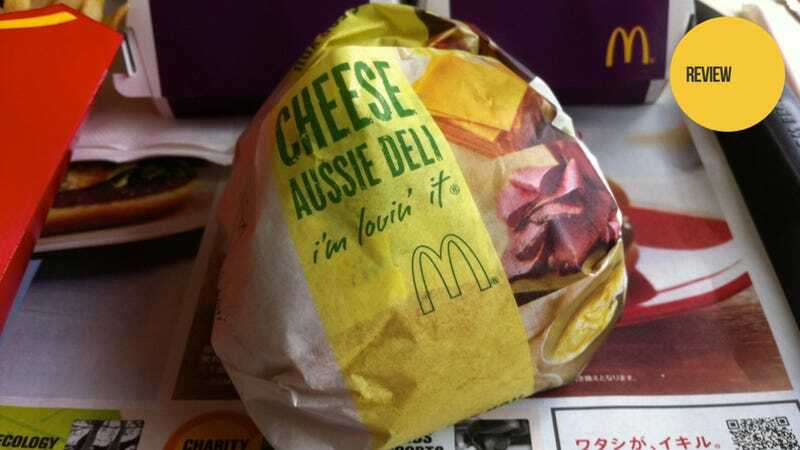 The Aussie Deli is how McDonald's Japan sees sandwiches in Australia. Okay, we got that! That's the snack concept, or as I like to say, the "snackcept". Unwrapping the sandwich reveals a bun, lettuce, bright orange cheese, and pastrami. There's some sort of vegetable relish and mustard. Look, I'm not Australian. I'm a Texan, and I've seen the misguided, though tasty, attempts of McDonald's Japan to make a Texas Burger. Ever since then, my McDonald's dinning experience in Japan has not only been through the prism of a snackster, but a cultural snackster. Let's not rely on McDonald's Japan to bring us the most accurate global taste experiences—but still, let's not discount the wonders that McDonald's Japan can offer. That being said, McDonald's Australia has a very different take via its own local menu, with the McOz burger (a Quarter Pounder with a slice of beetroot) and the Serious Lamb Burger. Australians take their snacking very seriously. Yet, the Aussie Deli is not a very serious sandwich! Ask any Australian (or, well, Luke Plunkett), and they'll tell you: If McDonald's Japan had used roast beef, it would have nailed this sandwich. Yes, of course, Australia has pastrami, but roast beef is much more of a sandwich staple. But in Japan, roast beef is pricey, and knowing that, pastrami just feels like a cheap substitute. But for this burger's snack concept (sorry, snackcept), pastrami will have to do. The commercials promoting the Aussie Deli talk about how "wild" it is. This isn't just trying to capitalize on Australia's rugged stereotype, but also on the notion of "wild" (ワイルド) in Japan. More recently, a popular comedian named Sugi-chan has made a career by showing how wild he is. (Inconsequential game connection: Sugi-chan is now appearing in 3DS ads.) As a cultural snackologist, I immediately think, yes, this Aussie Deli is trying to cash in on the notion of wild. But is it wild? Time to follow that question with another question. Have you ever had a so-so pastrami sandwich? Not great, not awful, just regular old supermarket pastrami on bread. Well, that's what the Aussie Deli tastes like. It's not exactly a snack sensation. You bite into the sandwich, and it's the standard one-two-three punch of pastrami, cheese, and bread. The relish, well, I don't quite remember the relish. That's never a good sign. Though, the mustard did give the sandwich some much-needed tang, though the cheese version mutes that somewhat. The Aussie Deli does come in two platforms: with cheese and without. If I were to have another go at the Aussie Deli, I'd circle back around with the non-cheese platform. While being an embedded snack emissary in Asia has opened up a realm of tasty treats, it has left a large void in a basic food group: the sandwich group. Japan is especially bad at sandwiches. The country does bread very, very well. Likewise, Japanese burgers can be triumphant. Sandwiches, however? They can get downright shocking, causing one to suffer from lack of proper sandwich nourishment. So keeping this culture construct (snackstruct, rather) in mind, the Aussie Deli, as average and pedestrian as it truly is, actually comes up a winner. In Japan, for the sandwich starved, who don't care about what a real Australian sandwich or hamburger looks like, here's a passable pastrami sandwich that should've been called "McGood Enough." Now that would've been wild.